I left off with imonsie and us going on an epic car ride full of insanity and hiliarty. So we leave the greater LA area through the Tajon Pass. Let me tell you, I'm glad the trip was when it was! With the storm systems we had last week, the Tajon Pass and the Grapevine were closed, I wouldn't have been able to get up there! Well, I would but it would've taken my like 8 hours instead of 4, lame. Anyway, we get on the 99 which is the highway we'll be taking all the way to Fresno. I hate it when my mom speeds but I found myself hitting 95mph quite a lot! I guess I don't like speeding when somebody else is driving, maybe it's knowing my own actions and my own car that makes me feel more secure. I definitely surprised myself! One minute I feel like I'm going 65-70 and suddenly I look at the speedometer and see I'm going almost 100! As soon as we hit the Grapevine it was foggy. One minute sunshine and the next fog, it was whacky. The fog was a bit spooky, it was super thick but also very bright because it was probably clear skies above it, so the sun was shining and the fog was thick. The fog stuck with us all the way to Fresno. We got to Fresno around 4pm (got on the freeway in LA at 12:30). We checked into our hotel and lounged, me flipping through channels like the Remote Demon I am. We relaxed a few hours and then headed to Red Lobster for dinner, mmmmm biscuits. One delicious meal later and we're back in the room. I find a Keanu Reeves movie and we watch for a few minutes. I see Monsie looking at me out of the corner of my eye, I wonder why. I'm about to turn the channel because, c'mon, it's Keanu Reeves, but then suddenly I realize the guy he's talking to is the lovely Hugh Laurie! I literally squawk and nearly fall off the bed! I think Monsie was waiting for my spazz but she didn't expect that kind of spazz, I scared her! It was so funny since I was bitching earlier about how there's always a House marathon on but there wasn't one that night! So we watch the entire scene and I change the channel after it's over. I keep switching back to it in the hopes he'll come back...and he does, for the very last scene. He got the last line though because he's Hugh Laurie and is freaking awesome. Anyway, the next morning we go and head Northeast towards Yosemite! I end up taking a wrong turn and we're driving on a street that's bordering some lovely orchards. Just another day in the Saries\Monsie adventure, it wouldn't be me if I didn't get turned around! Anyway, I find a spot to turn around and I get on the I-40, the Highway that takes you into the Southern Entrance. There's a lot of twisty roads but it's okay, I'm used to that here when I take the canyon roads to the valley. At some points though the car is super close to granite bolders which makes me uncomfortable. We start climbing and suddenly I see snow to my left. Snow to my right! I'm squeeing! Yeah, I always squee when I first see snow at my level, it's wired into my brain. I want to stop the car and frolic but of course that isn't possible. We stop at Oakhurst to fill up on gas and snack and head back up. We pass Fish Camp, which has so much snow! There were various "Snow Play" fields I wanted to pull over at but we wanted to get to Yosemite! We continue and finally reach the entrance to the park. It came up on us from nowhere so we couldn't get a photo of the sign, lame. I pay the fee ($20 for the week, pretty sweet) and start driving. So we're in the park, you'd think that's it right? Wrong. We have to drive another hour before we even get a glimpse of the valley! On the drive we pass the Wawona Hotel which is closed in the winter and we pass Yosemite West which has the Redwoods Cabins, I stayed there a few times as a kid, fun! 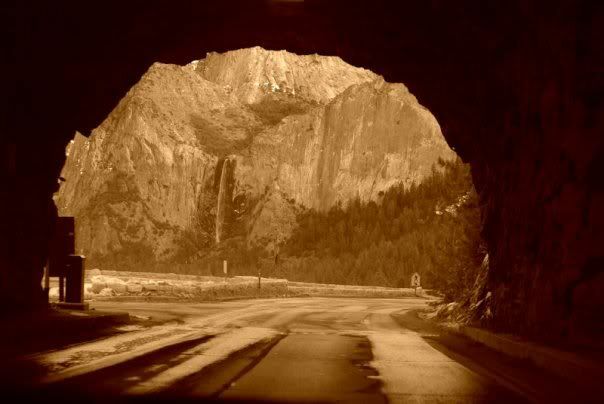 We pass the road that goes to Badger Pass and Glacier Point, the latter being closed from November-late May usually. Then, we see it. 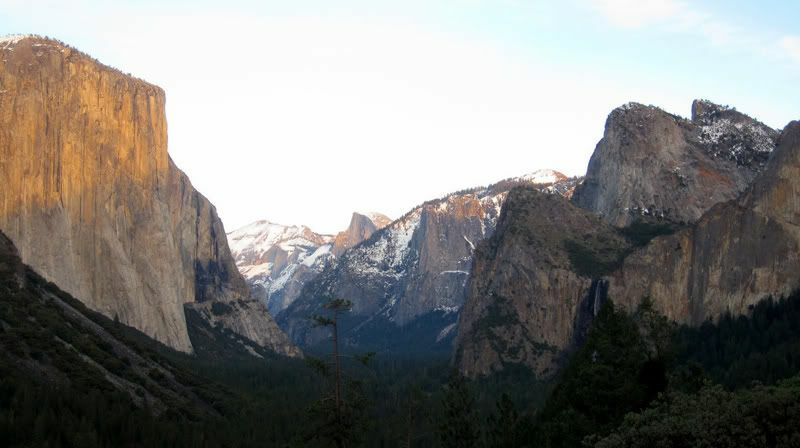 I forgot that you get a glimpse of the valley before the Tunnel View, it came up on us from out of nowhere! El Capitan and Half Dome. It was...amazing. We pull over and drink in the site of it. After about 30 minutes we keep driving and finally, after what seems like hours, we come upon the Tunnel. The Tunnel is amazing, it really is. It's cut into the mountain which I suppose isn't so amazing, you can find that anyway. What is amazing is that as soon as you exit you are greeted by the most amazing site.